For their last game in the North in the regular season, the Bulls had some fine pitching and a hit fest — 16, including two doubles and two home runs. Merrill Kelly, who wakes up each morning wondering whether he’s going to be a starter or a reliever, started and led the shutout allowing just two hits. Hak-Ju Lee, who is having a generally awful season (including two E’s last night) hit a home run in his first at bat to lead things off for the Bulls. That helped as the Bulls had trouble pushing runs across until the 8th. Still, they were seeing the ball well and putting a lot of guys on base. Mike Fontenot’s last several days have been terrific. Last night he went 4 for 6, as did Mikie Mahtook. Ray Olmedo only went 3 for 4, but drew two walks and scored three runs. Tim Beckham’s return remains strong. He was 1 for 5 last night. Justin Christian’s punishment of a three-game suspension for threatening the pitcher that hit him seems a bit harsh . (He made a few steps toward the pitcher with the bat still in his hand. I saw it. He was carrying the bat in the middle, at the balance point. Not in a striking pose. What was he supposed to do? Throw the bat away and then come after the guy who’d just hit him? No doubt, however, that he was really upset. As was Charlie Montoyo.) The punishment extends to the entire team. The Bulls are not allowed to replace him, so they will be a position player short for the next two games. Expect to see infielders in the outfield. At least the Bulls will be at home with the short left field wall. Christian’s right hand bat will be missed, though. I missed any update there might have been regarding Wil Myers. If he’s still with the team, that will help fill the gap. Meanwhile, that was the last out-of-division game of the year for the Bulls. And they will not be back in the North unless they 1) win the South Division and 2) win the first round of the playoffs against the West champion. If I’ve counted right, the Bulls have 12 home games and 5 road games left, all against South Division teams. Ice Bucket Challenge. I don’t know if this is a local or national challenge, but all sorts of local leaders and celebrities are participating in an “ice bucket challenge”, which amounts to standing in front of a camera and dumping a bucket of ice water over your head — all in a good cause — ALS treatment and research. All the local mayors seem to have joined in. Not to be outdone, Wool E. Bull, General Manager Mike Birling, and a cast of ... a lot ... have joined in. Note for twitteristas: See the hashtag #keepthecup that is out there. Good idea. Over at Rays Colored Glasses Robbie Knopf speculates on where Tim Beckham might fit in the Rays situation next year. 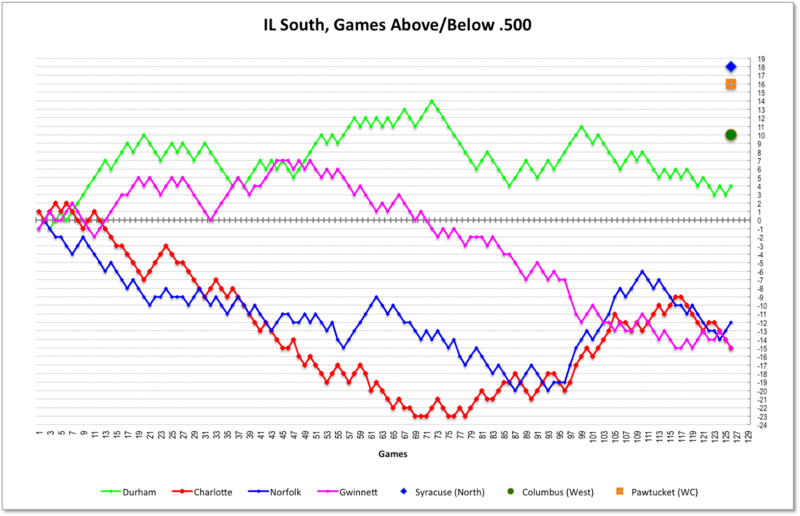 The Bulls come home well ahead of anyone else in the South Division, but stuck just a few games above .500.